- Motorized Helical Geared drive with Brake motor. We use Helical drive for better power efficiency. Brake motor with lever for emergency operation of lowering of Pallet. - Load carrying capacity of 2500 Kg per pallet. From our wide consignment, we are affianced in offering to our patrons an optimum class variety of 2 Level Puzzle Parking System. This system is designed in the form of matrix of rows and columns, such as 2 x 2 or 2 x 3 or 3 x 3 etc. Out of the total number of available spots, a certain number of spots is kept vacant to enable horizontal and vertical movement of remaining spots like a puzzle. This is an independent system, unlike the stack parking system and is fully automatic. Three-levels Parking Automat is a car parking system providing independent parking spaces for cars on three levels and side by side. Dimensions and specifications are in accordance with the specification sheet and final layout approved. Parking spaces are arranged on three different levels, one level on the top of the other. Puzzle Parking, is a fully automated system featuring combination pallets that enable horizontal and vertical movement of parking spots just like a puzzle to park and retrieve cars. A fully automatic independent system, it can be easily configured and customised to any property. 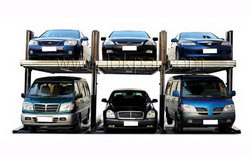 Owing to years of experience in domain, we offer superior quality Puzzle Parking Systems. 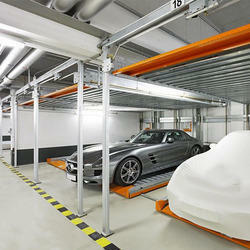 Our Puzzle Parking Systems are designed to utilize space efficiently to install parking equipments. Also, in these Puzzle Parking Systems are preferable up to 5 levels. - Parking possible in 2 to 6 levels above the ground, underground and combination of both. - Low parking and retrieval times – average of 60 to 90 seconds per car.